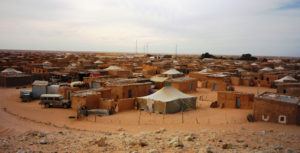 Many NGOs and human rights advocates have seized the opportunity of the currently meeting of The Human Rights Council (HRC) in Geneva to expose the abuses committed by the Polisario against the Sahrawi population in the Tindouf camps that the separatist front is running with an iron fist, at the instigation of the Algerian regime. In addition to the systematic repression of any dissenting voice, the Polisario, which challenges, with Algerian support, Morocco’s sovereignty over the Sahara in the South of the Kingdom, does not hesitate to resort to the kidnappings of the Sahrawis who oppose its separatist thesis, the human rights advocates and civil society activists have stated before the HRC. The Sahrawi activist Aicha Douihi drew the attention of the HRC to the systematic prohibiting of peaceful meetings and the denial of the right of association in the Tindouf camps. She cited as an instance the harsh repression by the Polisario militias of the peaceful demonstrations staged in solidarity with the dissident artist Najem Allal. She also raised the case of the former Polisario official, Khalil Ahmad Mahmoud, who was kidnapped in the camps in 2009 and detained in an unknown location in Algeria. His only mistake was to have expressed an opinion opposed to the Polisario’s. For his part, Sahrawi human rights activist, Abdelouahab Gain Brahim, brought up the tragedy of a young man named M’Rabih Ahmed Mahmoud Dah. For having dared to denounce publicly the abuses and corruption prevailing in the Tindouf camps, he has been abducted and tortured. And since 2014, his family has had no news of him, he said. On the long list of Sahrawis repressed by the Polisario also appear the names of Kamal Baba Yahya Najem and Ahmed Laaroussi Mohamed Salem. The two activists, founder-members of the Youth Movement for Change (MJPC), which fights corruption in the camps, have also been arrested and subjected to the worst ill treatments by the Polisario.